Flan de huevo, an orange-saffron flan with smoked caramel and sherry-poached raisins at Curate in Asheville, N.C. Smoking is a relatively simple method of adding robust flavor to meat, which explains why smoked meat continues to be a big trend on menus. 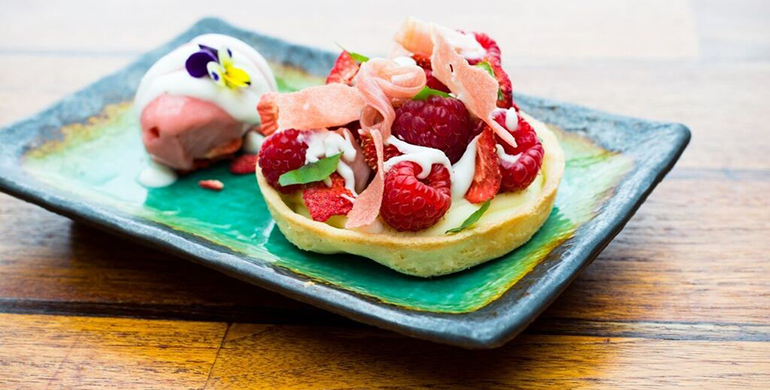 While animal proteins remain the primary recipient of the smoke treatment, chefs are increasingly using this preparation across the menu in much subtler ways, adding nuances of flavor to vegetables, cheese and butter, or deepening the flavor of desserts. Berry and Rhubarb Tart with a smoked coconut curd at Departure in Portland, Ore.
Gourdet, a self-described “savory chef driving a pastry program,” is currently serving chocolate ganache that features the classic combination of chocolate and smoked chiles, and is finished with a ginger, peanut and coconut caramel filling and tamarind sauce. Also adding smoke to dessert with a delicate touch is chef Katie Button of Curate in Asheville, N.C. Button is serving flan de huevo, an orange-saffron flan with smoked caramel and sherry-poached raisins. She uses a smoking gun to infuse smoke into granulated sugar that is then cooked to make the smoked caramel. Pastry chef Joshua Herrell enjoys working with unlikely savory ingredients in the desserts he creates for the Omni Bedford Springs Resort in Bedford, Pa. For example, on the menu at the 1796 Room steakhouse is smoked cherry cheesecake served with a thick sauce of boiled cherries that have been mixed with liquid smoke. Perhaps a little less subtle are the smoky s'mores at Saxon & Parole in New York City. Chef de cuisine Nicole Gajadhar pumps smoke from a smoking gun into a 10-ounce Mason jar layered with warm chocolate pudding, lemon marshmallows, caramel, caramel crumble, graham crackers and graham cracker ice cream, and then seals the jar shut. When the seal is broken tableside, diners get a waft of bonfire aromas before digging into their dessert. A huge fan of smoked, charred flavors and compound butter, Amber Lancaster, executive chef at Sable Kitchen & Bar in Chicago, is making a smoked shallot butter that she drizzles on seared salmon, finished with finely chopped parsley, chives, chervil and tarragon. Executive chef and partner Jaime Young of Sunday in Brooklyn in Brooklyn, N.Y., smokes butter for a dish of clams and mussels with fennel and absinthe that he's currently serving. "We decided to smoke the butter to give more depth to the briny flavor of the clams and its juice,” Young said. “The absinthe adds a unique twist to the flavor profile, which would otherwise be common or familiar." Herons at The Umstead Hotel and Spa in Cary, N.C., serves smoked butter-glazed ricotta dumplings, also sometimes called gnudi. Steven Devereaux Greene, executive chef at Herons at The Umstead Hotel and Spa in Cary, N.C., is smoking butter and using it is various ways on his menu, including to make potato puree and finish sauces, or as a glaze for vegetables. Both Michael Wilson, executive chef of Domenica in New Orleans, and Nick Leahy, executive chef of Saltyard in Atlanta, are serving smoked beets. Wilson pairs the bright-pink root vegetables with honey whipped ricotta, arugula, hazelnuts and pickled shallots, while Leahy serves them with carrot puree, curried pine nuts and feta. Meanwhile, Khamla Vongsakoun, executive chef at the Denver location of Departure, likes smoked cashews and serves them with coconut cream in a warm roasted carrot salad. Jimmy Bannos, Jr., chef and owner of The Purple Pig in Chicago, says olives and coconut are among his favorite foods to smoke. 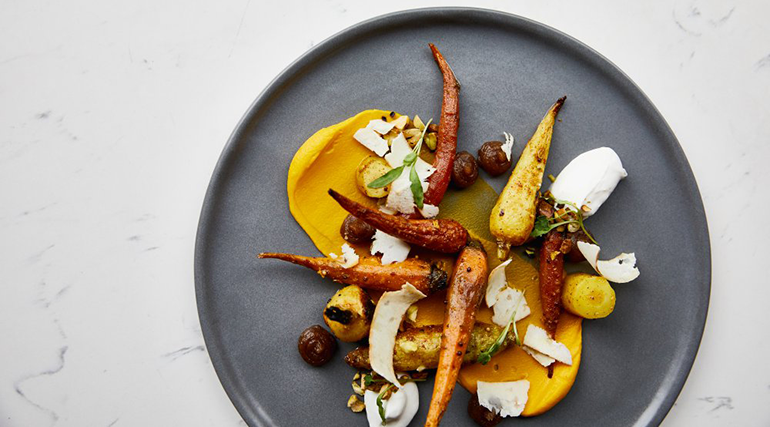 Outlier in Seattle serves vadouvan-curried carrots with smoked feta cheese, yogurt, date purée and pistachio. At Grey Ghost in Detroit, co-chef John Vermiglio makes smoked blue cheese dressing that he serves alongside jerk chicken wings. “We make the dressing and then cold-smoke it for 30 minutes. It helps to reinforce the smokiness that is synonymous with jerk chicken,” Vermiglio said. Chef Shawn Applin of Outlier in Seattle is serving vadouvan curried carrots made with smoked feta cheese, yogurt, date puree and pistachio.